50% or more of a home’s heating and cooling energy is lost through windows. Hunter Douglas Window Treatments provide different levels of window insulation that will keep your home warmer in the winter and cooler in the summer. The Duette® Architella® Honeycomb Shade considered to be the best insulating shade on the market today. Window treatments can pose potential hazards for young children and pets. All Hunter Douglas window treatments offer a wide variety of safety features that can reduce the risk of accidents from either eliminating operating cords altogether or keeping them a safer distance. Your window coverings are all that stand between you and the outside world through your windows. From sheer, semi-sheer, semi-opaque, opaque to total blackout, Hunter Douglas has the perfect solution to for the light and privacy control you need. Provenance® Woven Woods, for example, offer light-filtering reeds, grasses and woods, but with the addition of a lining you can control light control and privacy when needed. Window treatments not only add beauty to a room, they offer you the peace of mind that your carpet and home furnishings will be protected from harmful ultraviolet rays. Silhouette® Sheer Shadings, for example, have a Signature S-Vane™ that floats between two sheers to filters out brightness, glare and UV rays. Beautiful, safe and energy-efficient, all Hunter Douglas products are easy to operate. As a Hunter Douglas Dealer, we offer operating systems that range from LiteRise® systems that allow you push up or pull down your blinds and shades with the touch of a finger to the Platinum™ app that allows you to use your mobile device to control your Hunter Douglas motorized shades, sheers, draperies and panels. 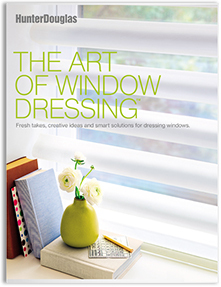 Contact us today to order your FREE Art of Window Dressing book or download the FREE Hunter Douglas Art of Window Dressing app to preview striking room photography and explore ideas for your own home. Treasure Coast Window Fashions provides more than just the finest window coverings. Our owners are involved in every project from start to finish to ensure your window covering project exceeds your expectations. We’re proud to serve the greater West Palm Beach area. Please contact us at 772-220-8870 or visit our showroom in Stuart, FL, for more information about our products and services.